Universities have been propelled into the center of the global political economy of knowledge production by a number of factors: mass education, academic capitalism, the globalization of knowledge, the democratization of communication in the era of the Internet, and the emergence of the knowledge and innovation economy. The latest book in the International Studies in Higher Education series, Universities and the Public Sphere addresses the vital role of research universities as global public spheres, sites where public interaction, conversation and deliberation take place, where the nature of the State and private interests can be openly debated and contested. 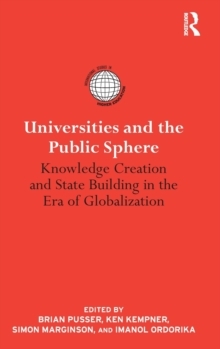 At a time of increased privatization, open markets, and government involvement in higher education, the book also addresses the challenges facing the university in its role as a global public sphere. In this volume, international contributors challenge prevalent views of the global marketplace to create a deeper understanding of higher education's role in knowledge creation and nation building. In nearly every national context the pressures of globalization, neo-liberal economic restructuring, and new managerial imperatives challenge traditional norms of autonomy, academic freedom, access and affordability. The authors in Universities and the Public Sphere argue that universities are uniquely suited to have transformative democratic potential as global public spheres.